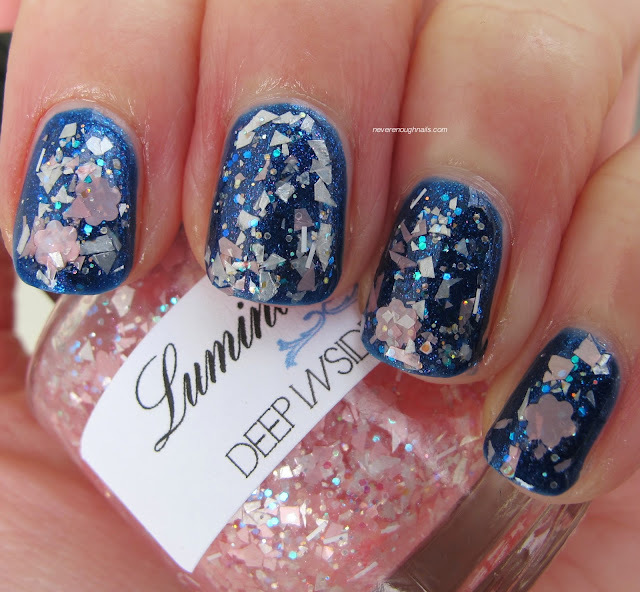 Lumina Lacquer Deep Inside of You was sent for review. Sephora by OPI Countdown to the Kiss was purchased by me. All opinions are my own honest thoughts. I always get super excited to try new indie polish brands, so it's no surprise that I was thrilled when two pretties from Lumina Lacquer arrived. I decided to try Lumina Lacquer Deep Inside of You first, being that I love Third Eye Blind. Yes, Lumina Lacquer has a whole Third Eye Blind collection! I can't help singing the songs when I read the names, especially Never Let You Go. 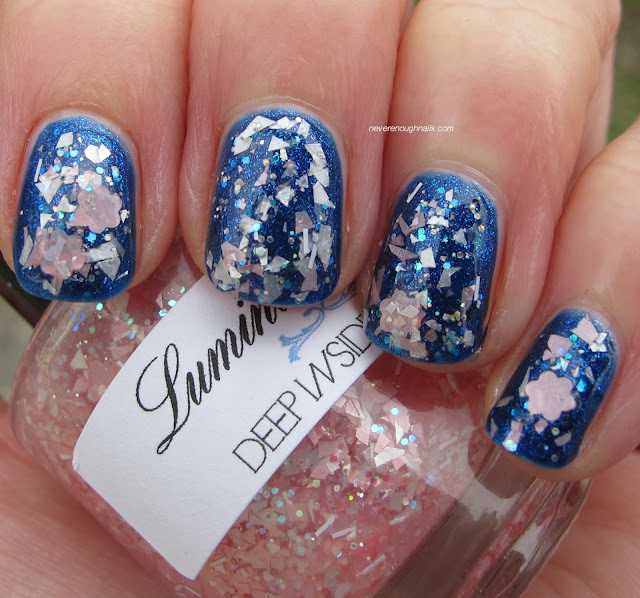 But anyway, Deep Inside of You is a mix of white and pink shredded glitter, pink flowers, a lot of small iridescent holo glitter and some other neat stuff in a clear base. Let me just say, I was ASTONISHED about how many flowers came out while I was applying this. There is no need to fish for them, I actually had to put some back because they wouldn't fit on my small nail beds! 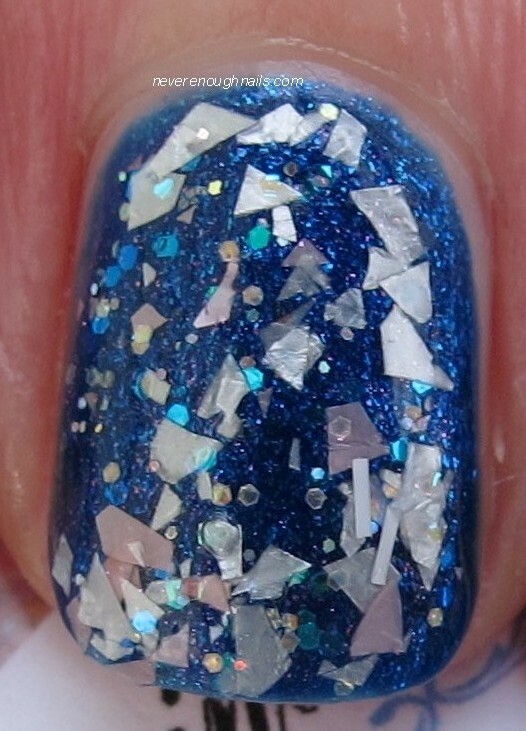 This is just one coat of Deep Inside of You dabbed on top of two coats of Sephora by OPI Countdown to the Kiss. The glitter is so plentiful, I didn't see the need to do another coat. Dabbing is really the best application for applying glitters like this. If you don't dab chunky glitters on already, what are you waiting for?? LOL. When dabbed on, this applies beautifully. Nice and easy to work with! It was fairly smooth with a coat of Poshe, but some of you smooth nail fanatics may want one coat of Gelous as well. I loved this polish and the next one you'll see SO MUCH that I ordered two more Lumina Lacquers immediately after swatching these!! Lumina Lacquers are available on Big Cartel. Deep Inside of You is currently sold out, but I'm sure she will restock soon and there are quite a few other pretties available now! this is my FAVORITE lumina lacquer...so far! I've been dreaming of a light pink glitter, & this was my dream come true. I think your choice to layer it over a royal blue is simply inspired. every little glitter has its own chance to show off. LOVE IT!! Thanks Frick and Frack!! The idea to layer it over blue just hit me and I'm so glad I did! Love this one too! Ashesela K- it is even more gorgeous in real life! Thanks Amanda! I don't know why I didn't try Lumina Lacquer before, I love this brand now too!